Tradition has it that Emperor Yuryaku was marching to battle with his armies, when a horsefly landed on his arm. Before it could bite him, a large dragonfly swept by taking the horsefly with it. Ever since, dragonflies have been used in the Nippon culture as symbols of courage and victory. This insect, called “Kachimushi” in Japanese, was forged on helmets, shields and swords of Samurai warriors to lead them to victory in battle. This limited edition fountain pen has been designed on the base of Namiki Yukari Royale pens. On the black Urushi lacquer we can find beautiful hand painted images of a dragonfly and a lotus plant. These carefully finished paintings are made with Togidashi (Burnished) Maki-e and Taka (Raised) Maki-e by master craftsman Masahiro. The texture and relief of these Maki-e drawings give the pen a truly sensational appearance which is perfected with the sprinkled gold-dust and the Raden / Mother-of-Pearl wings of the Dragonfly. This Namiki Kachimushi Limited Edition fountain pen has been created to bring good fortune and success to its owner. It was released in 2013 and only 150 units have been made! This Namiki fountain pen comes with a solid 18k gold nib with rhodium accents to give it a two-coloured appearance. 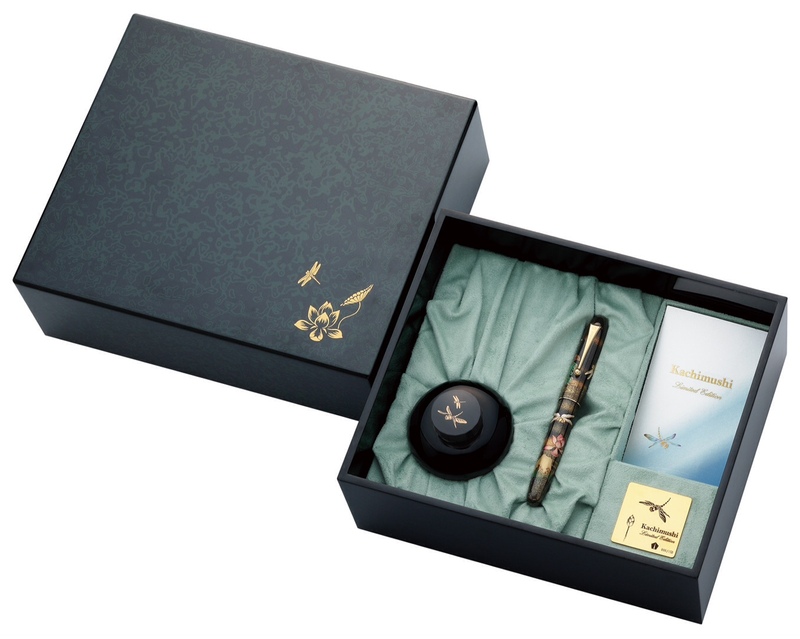 Since it is a limited edition pen, it comes in a special wooden Namiki presentation box finely lacquered with a traditional Kisotsuishu lacquer ware lid which has been polished to reveal a pattern that implies the sparkling surface of water. The pen comes with a special Namiki inkwell. If you are interested in more Namiki pens, please feel free to visit our website!